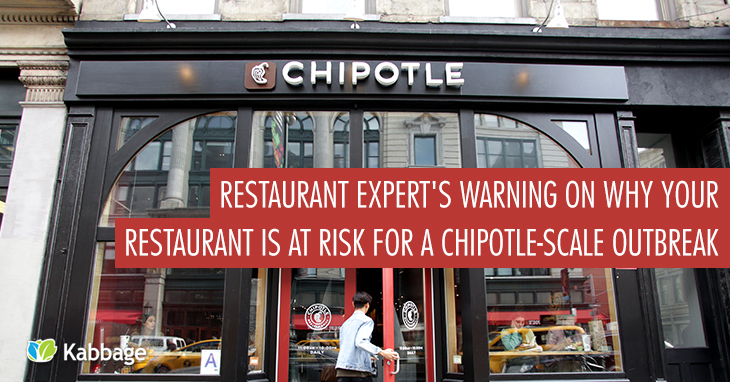 Is Your Restaurant at Risk for a Chipotle-Scale Outbreak? Foodborne illness has been a big item in the news lately for the restaurant industry, with chains such as Chipotle suffering big drops in sales and loss of consumer confidence due to outbreaks of e. coli, norovirus, salmonella and other foodborne illnesses. While contaminated ingredients and poor food safety practices are often blamed for being major causes of foodborne illnesses, industry research suggests that an even bigger culprit is something surprisingly simple: restaurant workers coming to work while sick. According to a survey by the Restaurant Opportunities Center (ROC) cited in BuzzFeed News, two out of three restaurant workers reported that they had cooked, prepared or served food while sick. The BuzzFeed article also cited a CDC study which found that 70 percent of norovirus outbreaks are caused by sick foodservice workers – and each year, norovirus results in $2 billion of costs to the U.S. economy in terms of health care expenses and lost productivity. If sick restaurant workers are such a leading cause of foodborne illness, why is it so rare for restaurants to offer paid sick leave? There is a widely accepted cultural attitude within the restaurant industry that people are expected to work hard and show up for every shift – even if they’re not feeling well. But as Chipotle’s massive sales declines have shown, if your restaurant is making customers sick, the cost of not offering sick leave can become more damaging than simply paying your sick employees to stay home. We talked with a few restaurant industry experts about the state of paid sick leave in the restaurant world, and how small independent restaurant owners can navigate the challenges of avoiding foodborne illness without sabotaging their bottom line profitability. Many restaurants do not offer any paid sick leave – workers are expected to show up for their scheduled shifts, or lose income. This often creates a tough situation for restaurant employees, who feel like they have to choose between their health and being able to pay their bills. But it’s a bit more understandable when you look at the larger context of how restaurants operate. Restaurants are a less profitable business than many people might expect. As of 2013, average U.S. restaurant profit margins were only 5.1 percent – and that was up significantly from 0.4 percent in 2008. With many restaurants struggling to pay their own bills and maintain positive cash flow, it can be hard for restaurant owners to budget for paid sick leave. Nick Mazing, a former operator with Aramark who now works as a portfolio manager at consumer-focused investment firm Ampera Capital, said that part of the challenge for restaurant owners is that many employees choose to come to work sick out of their own sense of financial self-interest. In the absence of an industry-wide standard for sick leave, Nick suggests that restaurant owners look to adapt their operations to be able to better handle employee absenteeism. Rick Davis suggests that more education about foodborne illness is key – especially by showing restaurant owners the link between sick employees and slower sales. However, Rick also believes that the overall restaurant industry has some significant cultural barriers to overcome if paid sick leave is going to be a widely adopted practice. Rick also says that fear of a Chipotle-style publicity nightmare could also drive restaurant owners to make big changes. In addition to seeking to prevent foodborne illness by implementing smart training and scheduling practices, restaurant owners should also consider how to protect their business in the worst-case scenario of a customer lawsuit. According to Ted Devine, CEO of small business insurer Insureon, many restaurant owners could benefit from double-checking their business liability insurance coverage. “In recent years, laws in the U.S. have evolved to favor the doctrine of “strict liability,” which means that if you buy something and use it correctly and it results in an injury, anyone involved in selling it to you (vendor, distributor, manufacturer) can be legally and financially responsible for the damages to you,” said Ted. This strict liability standard means that restaurants who serve food to customers – and whose customers then get sick from eating the meals – could potentially be vulnerable to a lawsuit (depending on state laws). And in the eyes of the law, it often doesn’t matter what the cause of the food contamination was. “According to strict liability principles, even if a restaurant handled its ingredients properly and maintained adequate cleanliness within its restaurant, it could be found legally liable and financially responsible for its customers’ illnesses,” Ted said. As people become more health-conscious and interested in knowing about the sources of the food they eat, consumer concerns about food safety are likely to intensify. This is going to put some added pressure on restaurant owners – but with a few best practices and protections, you can keep your customers safe and happy and keep your restaurant’s reputation clean! Are you a restaurant owner? What’s your take on the Chipotle foodborne illness outbreak? What should restaurant operators do to minimize risks and maximize profitability? Leave a comment and let us know!